Ironical that a page posts fakes for likes, which has been debunked on SMHoaxSlayer, talks about Fake News. It’d actually be quite appreciable if such pages sticks to truth as it has 21 lakh followers. Peter Parker’s uncle Ben said, with Great power comes great responsibilities, hope they acknowledge this now. Since last two years, I’ve debunked many fake posts from this page and it’s brother and sisters like Ultimate India, Indian Citizen, The Youth etc. It would be great for country if these pages with lakhs of followers start sticking to truth. But somehow it seems these pages as usual just wanna make use of Fake News issue as it is popular these days and almost every media is talking about it. ← Did CPI hang a decapitated Cow Head in public ? Photoshop is not for spreading Hatred ! 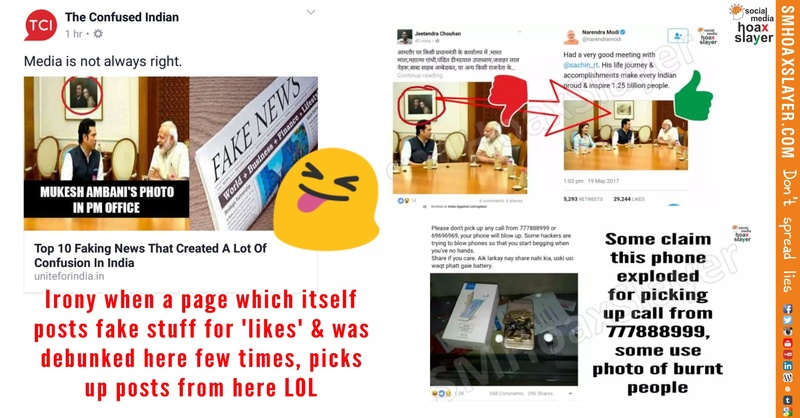 April 20, 2018 Hoax Slayer Comments Off on The photos Prakash Raj tweeted are years old and from different places.